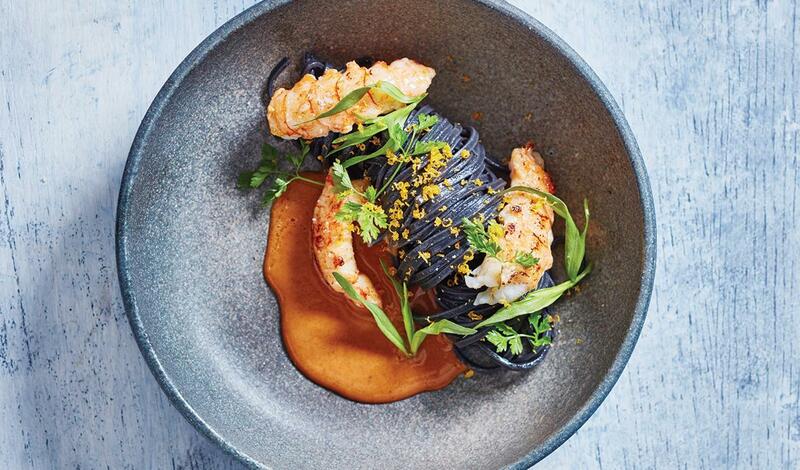 The creaminess of the sauce is the perfect carrier of the subtle seafood notes and flavors which are heightened by the umami of the cured egg shavings. Stir sugar and salt in a bowl and mix. Spread half in a baking dish. Make cavities with a spoon and lay the yolks in the cavities. Gently sprinkle remaining salt-sugar mixture over the top, covering up the whole yolk. Cover with plastic wrap and chill for 4 days. Clean the yolks thoroughly by brushing off all the salt. Transfer to a baking sheet, cover with baking paper and leave to dry in the oven at 200°F for half an hour. Store at room temperature up to 1 month. Reduce the Knorr® Ultimate Lobster Base by half, whisk in the cold butter and keep warm. Clean the langoustines, season with salt and pepper and grill until just tender. Cook the pasta in salted boiling water until al dente. Drain, add olive oil and mix well. Twirl the pasta and lay on plates. Divide the langoustines over the pasta. Garnish the plates with tarragon and chervil tops and then pour in the warm lobster sauce. Generously grate the cured egg yolk over the dish and serve immediately.